Even if Gaiman were making all this up, you would be inclined to believe him. 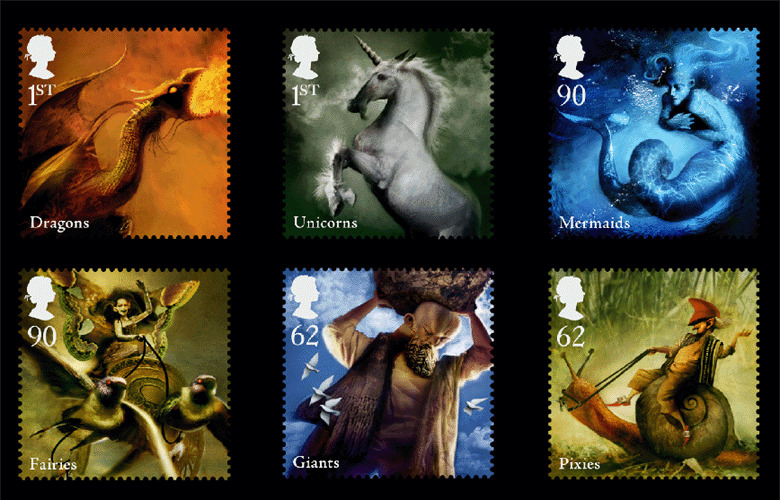 But all his stamp stories, which are published here for the first time, start with long-held British folk beliefs as their original source. And I noticed this morning Dave McKean grumbled that he didn't say the innocuous things the BBC attribute to him in this one. Just wanted to thank you for bringing attention to the latest censorship situation at the West Bend Community Library. I'm not sure if you (and your readers) are aware, but the librarians in West Bend have been dealing with a similar issue for the last several months, regarding a request for the removal of some - for lack of a better way to put it - not-anti-gay material in the young adult section of the library. Two weeks ago, the issue was finally resolved in favor of library policies, leaving the challenged books in the young adult section of the library. (A very brief overview of the ordeal is here: http://www.jsonline.com/news/ozwash/46772872.html ) A victory for sure, but this new challenge suggests that a pocket of the West Bend community is hell-bent on removing homosexual material from the public library - an action which would be a major loss for the community. Thank you for bringing attention to the issue, for always being a voice against censorship, and for your continued support of librarians in situations like this (I know you know we adore you, but really, you're a hero). Hello Neil, I recently read in your blog about the group of "Christians in Wisconsin" who are taking legal action for the right to burn a book (and payment for the "damages" it did to them). Speaking as a Christian (and a Wisconsin resident), I am appalled that any Christian would assume they have the right to publicly deface/destroy another's ideas (in this case in the form of literature). Although throughout history all sorts of atrocities have been committed in the name of Christianity, I naively like to think we have learned from that past. There's also a part of me that imagines things like this only happen in some faraway land, but I guess they happen right in your backyard just the same. Thank you for, in the very least, reminding your readers that there are "sane" Christians (if any of us humans really are sane at all), and not to let one group's actions speak for the whole. Just as the actions of Muslim terrorists should not allow us to judge any Muslim a terrorist, or genocide in Africa shouldn't lead us to deem Africans as savage. Anyway... I digress. Thank you for bringing attention to this. You're welcome. Right. Back to work. Oh, and last night I saw the first firefly of the year last night. So you know, and in case you were wondering.